THE LONG-RUNNING electronics store Peats World of Electronics is to seek a liquidator, it has emerged tonight. Staff were told that due to financial constraints, its 11 stores around Dublin have been closed with immediate effect. The business was first opened in 1934 by Brigit and William Peat, who sold wet cell batteries, bicycles, furniture and prams. 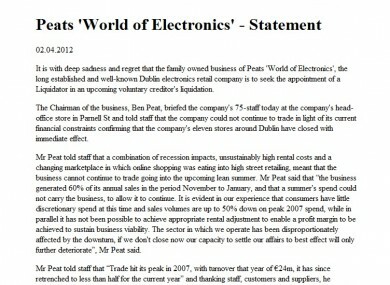 It is with deep sadness and regret that the family owned business of Peats ‘World of Electronics’, the long established and well-known Dublin electronics retail company is to seek the appointment of a Liquidator in an upcoming voluntary creditor’s liquidation. The statement said that Ben Peat, the company’s chairman, briefed the 75 staff today at the company’s head office store in Parnell St. He told them that the company could not continue trading because of its current financial constraints. [T]he business generated 60 per cent of its annual sales in the period November to January, and that a summer’s spend could not carry the business, to allow it to continue. It is evident in our experience that consumers have little discretionary spend at this time and sales volumes are up to 50 per cent down on peak 2007 spend, while in parallel it has not been possible to achieve appropriate rental adjustment to enable a profit margin to be achieved to sustain business viability. The sector in which we operate has been disproportionately affected by the downturn, if we don’t close now our capacity to settle our affairs to best effect will only further deteriorate. Trade hit its peak for Peats in 2007 with a turnover of €24m but has retrenched to less than half of that for the current year, staff were told. [W]e have tried very hard to establish solutions with suppliers and landlords that could have brought balance and sustainability back into our business. We have implemented extensive cost-reduction at all levels including payroll and terms of employment, but unfortunately it is beyond our power to continue in operation and we have to protect our staff, creditor, debtor and legal interests to best possible effect and do right by all concerned as far as is both humanly and financially possible. All of the staff will be paid their entitlements and redundancy due in full. Peat said that the company’s staff “have always been exceptional” and described them as “one big extended family within which three generations of the Peat family still currently work”. The website states that all telephone calls to the closed stores will be directed to a call centre to deal with any enquiries. Email “Peats to seek liquidator - 11 stores closed”. Feedback on “Peats to seek liquidator - 11 stores closed”.